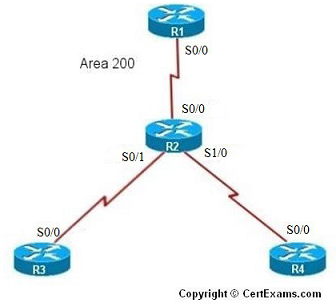 Description: In OSPF single area, you configure OSPF network with an area ID.The configuration example uses four routers working in area 200. 7. Enter 192.168.1.0 as network address , wildcard mask 0.0.0.255 and area 200 and click OK button. 11. Repeat steps 2 – 7 for configuring R3 S0/0 interface ip address as 192.168.2.2 255.255.255.0 and select disable from interface status drop down box, and network addresses 192.168.2.0 , wildcard mask as 0.0.0.255 and area 200. 17. You will see that serial 0/0 is down so bring it to up state using Interface Management > Interface and Connections this displays Interface and Connections screen. Click Edit Interface Connection tab. Select S0/0 interface from the list and click Edit button. In the interface feature edit screen select Enable from the interface status drop down box and click OK button.